In the lands to the West of the Guardian Peaks, there are zombies, necromancers, sorcerers, demons, goddesses, monsters half-human and half animal, and shapechangers that may be either or both. Political intrigue, war, love, lust and seduction all play their part, and yet there is a code of honor and to break it means death. Everything and nothing may or may not be as it seems, and yet for both the beautiful but evil, scheming Lady Thorn and for Oscan the young man she seduces, their lives will be changed by events that neither could have predicted. Perhaps there really is a prophecy that sets them on an unalterable path, or perhaps they can take control of their destiny. Oscan, with six fingers on each hand, should have become a sorcerer or even a full wizard, but he has been cursed by Thorn, allegedly to stop him fulfilling a prophecy that he will kill her. He can no longer draw power as any other sorcerer or wizard does, and instead he becomes a death-mage, taking power from dead people and creatures and using it in ways that would horrify normal people. 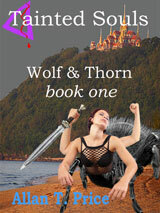 Ironically, he vows to kill Thorn for putting the curse on him, and he sets out to build the means to destroy her.